I came across this scene while on a bike ride along the CA State 56 freeway during the evening rush hour commute on Friday. 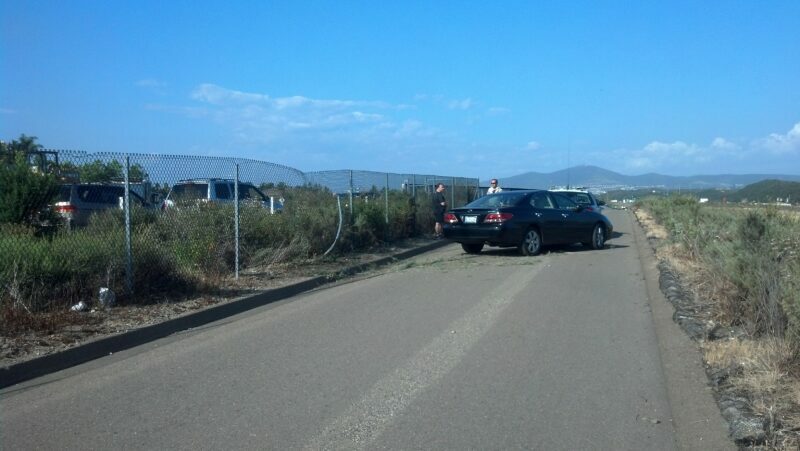 The car in the picture went off the road, through a fence and came to rest on the bike path that parallels the freeway. The accident happened about 5 minutes before I arrived on scene. The scary part is that my bike ride was delayed by about 5 minutes when I returned home to retrieve my cycling gloves. If we had met, I would have been hit head on (I took the picture after passing the car). A few years ago, one cyclist was killed by a motorist running off the road and onto this same bike path. This tragic incident, hearing stories about other “near-misses” and seeing numerous holes in the fence over the years makes me think this path is nothing more than a bike lane on a freeway. While the concept of a walk/jog/bike path along this East-West corridor is commendable, the design is severely flawed. Simply put, distracted drivers in speeding cars and cyclists do not mix. I ride the bike path about 3 times a week and more often during the summer. Seniors, parents and their young children; people of all ages enjoy this trail. I preferred the path because it appeared safer than the surface streets for riding my bike. I have serious doubts now. One of Caltrans’ top Strategic goals is to “provide the safest transportation system in the nation for users and workers.” In not providing San Diegans with a safe way to ride on the SR-56 bike path, they are failing in meeting one of their own goals. A more substantial barrier than a flimsy fence should be erected to ensure no more preventable deaths like Venuto’s happens. We contacted State Senator Marty Block whose district covers the SR-56 bike path to ask that his office take a lead on ensuring that Caltrans move on installing a more substantial barrier. 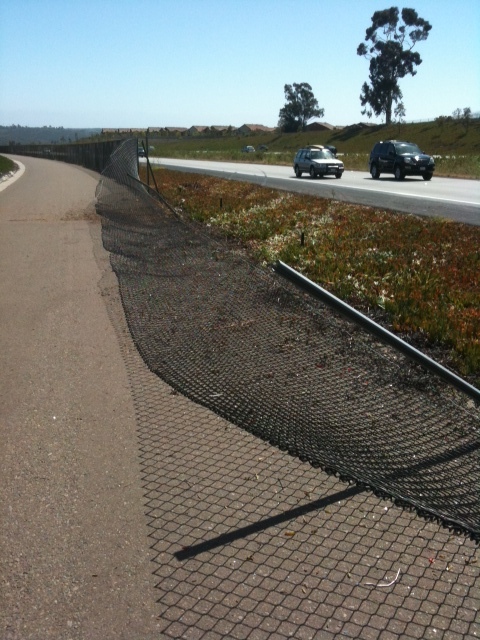 By May 21st, after some level of media attention, Valentine wrote to the Rancho Penasquitos Planning Board requesting that the Planning Board support his request to compel Caltrans to put in a sturdy guardrail to make the bike path safe. 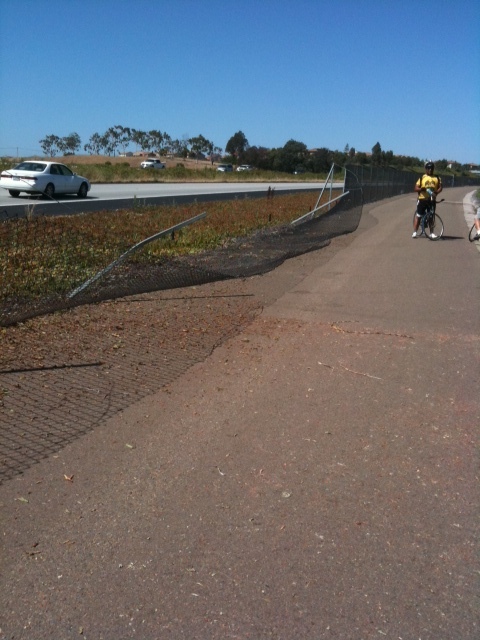 Guardrail – It would be nice to install a guardrail along SR 56 where the Bike Path is close to the freeway. Four cars have left the freeway and ended up on the Bike Path since SR 56 opened. Nick Vento was killed in May 2011 in an extremely rare event, but users of this path expect a level of safety higher than they are getting. Class II riders throughout the City have different expectations. As an alternative to metal beam guard railing, Caltrans plans to install concrete barrier along the edge of shoulder of EB SR-56 in areas where the bike path is less than 30 feet from the edge of traveled way. In these areas, the barrier will not be introducing a fixed object where there would otherwise be the standard minimum clear recovery zone for errant vehicles. Funding to design and construct the proposed project is anticipated for FY 2013/14 or FY 2014/15. I am pleased to learn of your response to a recent Rancho Penasquitos Planning Board request regarding bike path safety concerns along the SR 56 freeway. Your understanding of this serious public safety issue and the proposed remedy is admirable. However, given the serious risk to a significant number of cyclists, joggers, parents and children who utilize this bike path, it is requested that you make every effort to allocate funds in this fiscal year. In addition, I would request guidance on how the public provides input into the design and construction of the barrier along the path. Again, I applaud your sensitivity and your action to make the SR 56 bike path a safer and more user-friendly experience for everyone. Caltrans has not responded directly to my initial request and have publicly stated they cannot comment due to pending litigation related to the death of the cyclist Nick Venuto almost 2 years ago. The Caltrans response I obtained was from a March 6th Rancho Penasquitos Planning Board request via e-mail to look into the possibility of installing a barrier along the SR 56 bike path. The request apparently was not through the formal meeting process (since I couldn’t locate the request and Caltrans’ comments in the meeting minutes). I e-mailed the RPQ Planning Board chairman on Monday night requesting a copy of the e-mail with the Caltrans response but have received no response as of yet. My concern is that the pending litigation against Caltrans could severely or even permanently delay action to mitigate this very serious public safety issue. Any action on your part to help ensure that Caltrans will follow through on their stated commitment would be greatly appreciated. As well, I believe my request to move up the timeline to install a barrier along the path is not unreasonable. We haven’t heard anything further from Block’s office. It is noted that four traffic collisions were documented in the report. Incident #4 dated 5-31-11 was the Nick Venuto fatal incident (including another person experiencing major injuries). The diagram and summary were deleted from the document (I suspect due to “pending litigation” or severity of the event). My hope is that no other incidents were omitted from this report. Since June 2008, counting the 4 Caltrans documented events, 2 additional photographed incidents in June 2011 and March 2012 (see attached photos) and my recent event on May 10, 2013 (attached photo), the number of documented traffic collisions on this bike path totals seven events. This equates to one bike path breach every 8.6 months. At least 2 of the events (almost 30%) occurred during rush hour- 6:20 pm and 5:00pm; a time when freeway traffic and bike path usage are correspondingly high. As well, alcohol or fatigue were not factors in the collisions. Conclusion: It is not a matter of if another fence breach will occur but when, where and who will be affected. The Caltrans proposal calls for a total of 733 feet of barrier to be installed along the entire bike path that extends some 10 miles. As best as I can determine, none of the seven documented collisions occurred in areas where the barriers are proposed to be installed. These events took place in areas where ice plant or shrubs are part of the landscape, doing nothing to stop the vehicles from reaching the path. Conclusion: Install barrier along all areas where there is a possibility of a bike path breach. I believe it is imperative that every public agency/planning group do their part to ensure there is an expedient and adequate solution to this public safety issue. It is encouraging to know that Michael Lieberman (Representative Brain Maienschein’s office) has pledged to take the lead in communicating with Caltrans to ensure progress is being made to resolve this issue. Senator Marty Block’s office is also aware of developments relative to SR 56 bike path safety. I would ask the Rancho Penasquitos Planning Board to lend vigorous support in getting this project to completion. I appreciate all your efforts to ensuring the safety of the SR 56 bike path. Yesterday evening, we had another similar incident that sadly resulted in injuries for the bicycle rider when a car flew off I-5 and onto Santa Fe Road. As of today, no changes have been implemented on the SR-56 – two years after Venuto’s death. Who knows how long it will take for Caltrans to implement changes along Santa Fe Street that adjoins the I-5. Will it take a lawsuit or a death before safety improvements are made? We know Caltrans management can direct quick action when needed. Last year, Caltrans moved with incredible swiftness to remove Nick Venuto’s ghost bike. However when it comes to the safety of San Diego’s bicycle riders – Caltrans remains unwilling to move or act. We would like you to write to Caltrans and ask them to install a protective and permanent barrier to protect the vulnerable road users from the vehicle operators who continue to put riders in danger and their lives at risk along SR-56 and I-5. Email Caltrans at ct.public.information.d11@dot.ca.gov and copy your state elected official in your correspondence.